One of the major English romantic poets, considered to be among the finest lyric poets in the English language. 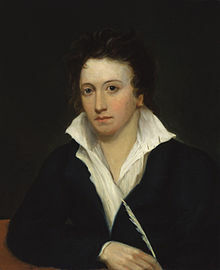 "One Word is Too Often Profaned"
"Shelley, Percy Bysshe," in Alumni Oxonienses: the Members of the University of Oxford, 1715-1886, by Joseph Foster, London: Parker and Co. (1888–1892) in 4 vols. "Remarks on Shelley", by George Edward Woodberry from Studies in letters and life (1890). "Shelley, Percy Bysshe," in Dictionary of National Biography, London: Smith, Elder, & Co., (1885–1900) in 63 vols. This page was last edited on 24 November 2018, at 10:55.